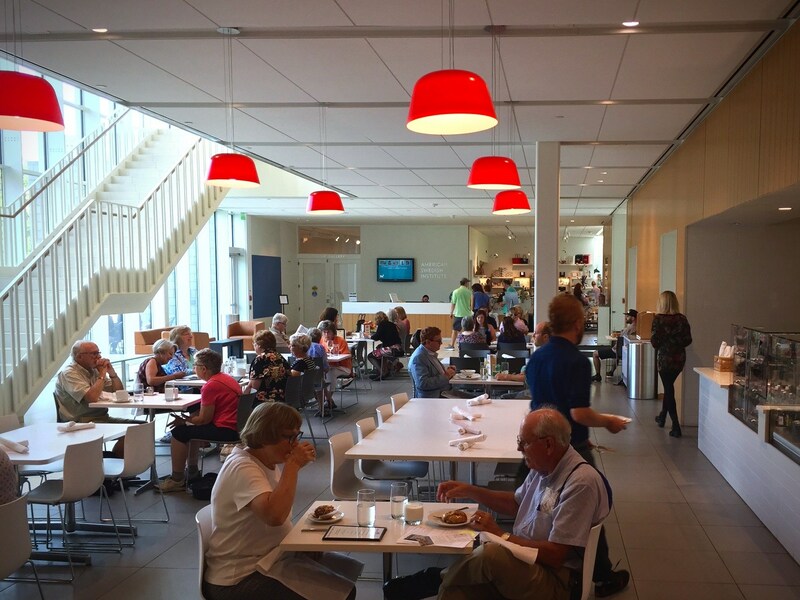 Fika (the name means coffee break in Sweden) is the hypermodern, innovative and esthetic cafe, bakery and cocktail bar of the American Swedish Institute, which has won accolades under all three of its chefs since its opening in June of 2012. It’s easy to spend upwards of $30 on lunch there, and more if you get a cocktail or two with it. Of course, you can also get out for under $20 if you’re really careful. But who wants to be careful when going out to lunch? Careful food is for grocery shopping. Located in the modern art center, the decor is functional, almost stark. You’re flanked by the entrance and the extremely upscale gift shop in one direction, and the new building’s rest rooms and hallways leading to art galleries in the other. There is a bakery display case with the prettiest savory tarts, puddings, cookies, scones, buns and fruit crisps you ever saw, with the kitchen open behind it. The room has super high ceilings and lots of glass, white surfaces and chrome. The drinks and desserts menu includes beer, wine, cocktails, house-made sodas and the usual coffee-tea-soft drinks stuff. The food menu is grouped into Salads, Small Plates, and Smorgasar (open-face sandwiches), followed by Desserts, “Egg tarts” and Bakery items. There is also a soup and a lunch special daily, and the egg tart comes in a daily rotation of two, one vegetarian and one not. The Dish visited on a Friday afternoon; it was pretty full, but we got seated immediately. First off we tried out the house-made sodas. And alas, I didn’t like mine! Although it clearly states on the menu that the cream sodas, unlike the cream sodas of my youth, actually have—gasp—cream in them, I guess my brain just rejected that reality. So I ordered the Birch Cream Soda, expecting a sort of adult version of a fondly remembered soft drink from my childhood called birch beer. But it was just what it said on the menu—birch extract, soda water and cream. Fortunately, my kind server allowed me to order a different soda and specify no cream in it. I got a Bergamot Cream Soda sans-cream, which had a house-made bergamot syrup and soda water, and was much more to my liking. For the lunch meal we were really spoiled for choice. The special was a small plate of duck and some other intriguing things; the regular menu came down to salmon, salmon (gravlax) or trout for me. Not tempted by the small plate offering of Swedish Meatballs with potato puree (chef-talk for mashed potatoes), I might consider the other one on a return trip—braised rabbit with potato gnocchi. What? The last time I looked gnocchi were Italian. There is a duck confit terrine smorgasar with some lovely accompaniments, but upon inquiring I found, as I had suspected, that the terrine includes chicken and pork (most terrines do) and I am not a fan of pork in any of its forms. The other two smorgasar I also didn’t consider because they were pork based. The gravlax and the trout (Steelhead, pan seared) are on the small plates section, while the salmon is also available as a smorgasar. The trout comes with braised black lentils, roasted carrots and crispy fried kale, which is absolutely my kind of veggies. It also has bacon on the side, but since that’s prepared from scratch I could have asked for it to be left off. The salmon smorgasar includes watercress, beet and sweet mustard sauce. All the smorgasar are served on danish rye, which is rich, dense, nutty and slightly sweet. But ultimately I went for the gravlax small plate, which also included a slice of danish rye. The generous serving of gravlax came with sides of watermelon radish, fresh dill weed, super finely minced red onion, salty dried capers, a blob of some dairy product (creme fraiche or quark, or maybe ricotta or its Scando equivalent) with caviar on it, sweet grainy mustard, and little squirt-dots of two condiments: a mellow sweet mustard sauce and a berry puree of some kind. My half-order of house salad is a minimalist masterpiece, the seasonal greens appearing to be 100% baby arugula and the extras being toasted rye berries, mustard seeds and tissue-thin radish slices, all delicately dressed in banyuls vinegar. This all looks like a Swedish fashion model’s diet plate, but actually it was quite filling. I didn’t need to get dessert, but I made the effort anyway in order to tell you about it. Terrible sacrifice. I picked what sounded very Swedish: a cardamom bread pudding, thick, moist, very redolent of cardamom (which is an insanely expensive spice by the way; have you tried to buy any lately?) and paired with scrumptious brandy caramel sauce and cinnamon-spiced whipped cream. But I could have just as well have gone for a chef’s choice plate of little Swedish cookies, Lingonberry Rice Pudding, Chocolate Mousse or Apple Crisp. The cocktails menu is intriguing, with such delights as sloe gin, Minnesota-made aquavit, Panther white whiskey, and Montana Gold (herbal tea) infused brandy and a drink called Bloody Swede (an aquavit-based Bloody Mary with the addition of pickled beet brine). I shall have to go back on a Wednesday evening for a cocktail-centered dinner. Fika is closed Mondays. Tuesdays, Thursdays, Fridays and Saturdays it’s open 8:30 a.m. to 5 p.m.; Sundays from 11 a.m. to 5 p.m.; Wednesdays from 8:30 a.m. to 8 p.m. The “full” (i.e., lunch) menu is available from 11 a.m. to 3 p.m. every day except Wednesdays, when it’s available straight through until 8 p.m.